April in the desert garden is, in my humble opinion, the most beautiful time of year. Winter and spring-flowering plants (damianita, penstemon and ‘Valentine’) are just beginning to fade and summer blooms are beginning to appear (coral fountain, Texas sage and yellow bells). But perhaps, the most colorful event in this month is the flowering of palo verde trees. Did you know that each species of palo verde has a different shade of yellow? It’s true. The differences may not be obvious unless you see them next to each other, but I’ll make it easier for you and show you some examples below. Every year, the arrival of the yellow flowers are met with delight by many and to the dismay of others. Those that like unnaturally, pristine landscapes, without a stray leaf or fallen flower, don’t like the flowers that they leave behind. As for me, I like things mostly natural and the golden carpet that my ‘Desert Museum’ palo verde trees leave behind, area welcome sight. Yesterday, I went on Phoenix Home & Garden Magazine’s Grand Tour of Gardens. The gardens we visited were spectacular, but we also passed by equally impressive landscapes. This one in particular caught my eye, so my husband stopped the car and patiently waited while I took a few photos – this tends to happen often, so he is used to it. While I liked the contemporary entry to the front flanked by desert spoon and with the columnar cardon cacti surrounded by golden barrels, it was the majestic ‘Desert Museum’ palo verde trees that caught my eye. The plant palette was limited, which works well with contemporary design. The flowers from the palo verde trees along the street decorated the grass and sidewalk, although they were badly pruned. While my personal style is more informal, I do appreciate good, contemporary design and I really liked this pathway, although I believe a better species of agave that can handle full, reflected heat without growing too large would have been better – maybe Victoria agave? I’m still loving the flowers. My favorite picture is this one of the entryway which is covered with a solid carpet of golden yellow flowers, which contrast beautifully with the gray-blue walls and red door. How about you? Do you like the way flowers look on the ground once they have fallen? Or do you feel the overwhelming impulse to blow them away? https://www.azplantlady.com/wp-content/uploads/2015/04/flowering_blue_palo_verde-1.jpg 946 1024 arizonaplantlady@gmail.com http://www.azplantlady.com/wp-content/uploads/2018/10/favicon.png arizonaplantlady@gmail.com2015-04-13 13:30:002016-10-26 14:35:38"April Showers Bring Golden Flowers"
Question: Do you like the way fallen flowers look in the landscape? Some people describe the layer of spent blossoms of trees or shrubs as a ‘colorful carpet’ that adds beauty to the landscape. Or do you feel the pull of your leaf blower calling out to you whenever you see a layer of spent blossoms littering the ground? For me, I love the beauty of small, fallen flowers. It is a natural occurrence and benefits the soil and plants as they breakdown. In spring, palo verde trees are covering the ground throughout the southwest with a yellow carpet. In winter, red blossoms from Valentine shrubs (Eremophila maculata ‘Valentine’) create a carpet of red and in the summer months, Texas sage, (Leucophyllum species) leave a layer of purple in their wake. Of course, if you have a swimming pool, you may want to clean up the flowers and put them on your compost pile. So, what about you? Do you allow the flowers to remain or do you clean them up? Can you tell what is wrong with this Mesquite tree? This tree has mistletoe growing in it. It is hard to spot mistletoe when it first infects a tree. I can spot it right away, but it takes some time to recognize it when it is small. Look for green growth that has a slightly different shape and texture then the tree leaves. You can see where the mistletoe has attached to the tree branch. Mistletoe is easier to spot in the winter, when many of the trees are leafless. The types of trees that I see with mistletoe are mesquite, palo verde and sweet acacia. Because mistletoe is a natural part of the desert ecosystem, there is debate about whether or not to remove it from trees. Mistletoe does not kill your tree, but it can stress them because it steals nutrients from the tree. This can leave the tree open to additional stresses that can kill it. Mesquite tree heavily infested with mistletoe. As a Certified Arborist, I recommend removing mistletoe infestations from trees in landscape settings. You may not mind the mistletoe, but it is spread by birds and your neighbors may not be too happy when their trees start sprouting mistletoe. In the natural desert, I would leave mistletoe alone because it is part of the natural ecosystem and its berries are a food source for birds. This small mistletoe growing on a palo verde tree trunk cannot be completely removed. But, you can break off the mistletoe easily and keep it from becoming more established as long as you remove any new growth as it occurs. Thank you all for your supportive comments regarding my son Kai and his recovery from his sixth hip surgery. His recovery has been harder this time with the pain. Also, he is a lot heavier then he was the last time. We have to carry him from his bed to his wheelchair to the toilet. Kai is know finished with his prescription meds which has helped ‘clear his head’ a little bit. Ibuprofen is not as effective with the pain, but it is manageable. This week, instead of our weekly dinner at the family farm – they came over to our house because it is hard to transport Kai. 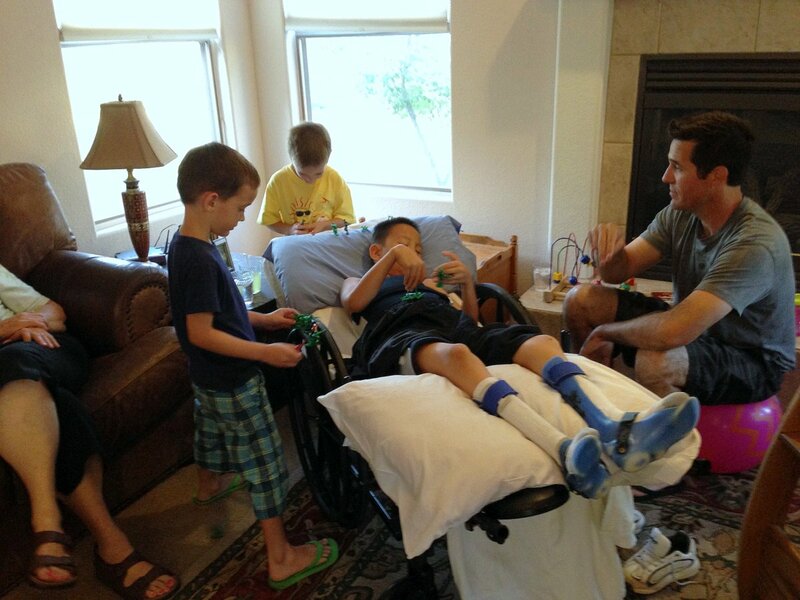 It was fun seeing his young cousins play army men with Kai using his wheelchair as a battlefield. Kai is enclosed in a ‘cloverleaf’ brace that covers his torso and both legs, which helps to immobilize his hip. The blue braces on his lower legs are his AFO’s which he has to wear all the time. They add strength to his lower legs and keep his feet straight (he has had surgeries on these areas as well in the past). I stepped outside, early this morning, and did a little pruning to our palo verde tree that was hanging too far over our front entry pathway. It felt great just doing something normal. My Favorite Pastime….Shopping For Plants! Well, the title says it all. I love plants and shopping. Pair those two things together and I am in heaven. Back when I managed landscapes, I had a company credit card which allowed me to purchase to my heart’s content….okay not really, I did have to stay within my plant budget, but it was so nice to spend someone else’s money. My most recent journey into the plant shopping occurred last week with my mother, Pastor Farmer of Double S Farms. She was purchasing some trees for their farm and wanted my assistance in selecting them. And so, we journeyed to a local nursery (not a big box store). Now this particular nursery is not what I would call a native plant nursery, although they do carry many native plants. But they also sell tropical plants that thrive in our semi-tropical climate. You can see Gabriel coming up to help us to tag the trees we selected. On our way to the tree section, we passed a mass of Bougainvilleas. It looked like a Bougainvillea forest. Then we passed through the shaded area of the nursery where frost-tender tropical and shade-loving plants were kept. Now, we were beginning to get into the tree section of the nursery. You may have noticed that my pictures are taken from behind my mother and our helper, Gabriel. Well, put me anywhere with plants….a nursery, a garden, it doesn’t matter – I will always be lagging behind as I love to look, touch and take pictures of plants. We passed the flowering Palo Verde trees…. We passed some Olive trees…. Did you know that the pollen of the Olive tree is highly allergenic? It’s true. Actually, because of this, you can only plant a certain variety of Olive tree in our area, called ‘Swan Hill’, that do not produce pollen and therefore do not produce any flowers. The ‘Swan Hill’ cultivar was found in Australia years ago from a 30 year-old Olive tree that had never fruited. It is an interesting story and you can read more about it here. Okay, back to our search for our tree. Well, I wish I could say that I had a great picture to show you of the Chilean Mesquite (Prosopis chilensis) tree we selected. But, it turns out that I was so busy helping to select the tree, I forgot to take pictures of it. On our way out, I did take pictures of a bunch of Sago Palms (Cycas revoluta), which aren’t actually palms at all, they are cycads. They grow extremely well here, but must be protected from full sun or their fronds turn yellow from sunburn. Well, we were at the end of our plant shopping journey, or so I thought…. As my mother was paying for the trees, I noticed one of the resident chickens. Can you see her? She is poking around the base of this plant fountain. One of the employees noticed my interest in the chicken and motioned me over to the side of the building, where on a potting table, there was a large container. I looked inside and saw how busy the chicken had been…. Every afternoon, at about 4:00, she sits up there and lays another egg. Now, the father, is no absentee father. He takes his job very seriously. He was keeping a keen eye on us until we left the nursery. Well, I had a wonderful time, I just love visiting local nurseries. We selected some beautiful trees and the new Mesquite tree will grow very quickly and will be quite large. Pastor Farmer envisions having an old tire swing being put up in the tree in a few years for the grandkids to play on. https://www.azplantlady.com/wp-content/uploads/2010/05/DSC03430.jpg 567 640 arizonaplantlady@gmail.com http://www.azplantlady.com/wp-content/uploads/2018/10/favicon.png arizonaplantlady@gmail.com2010-05-20 18:09:002016-10-26 14:36:53My Favorite Pastime....Shopping For Plants! Christmas in the desert is much the same as it is around the world. Christmas lights adorn homes and trees, with a few notable exceptions. This is the desert after all….we sometimes do things a little differently. First of all, we have a town Christmas tree made entirely out of tumbleweed. It is painted white and really looks quite beautiful at night when lit up. We have a huge celebration each year when the lights are lit for the first time. See…. I told you it was made out of tumbleweed. For those of you who do not know what tumbleweed is, it is the light brown, prickly, round shrub that you see rolling through the town when you watch old Western movies. *Disclaimer – contrary to popular belief, it is rare to see tumbleweed rolling through the desert. We desert dwellers also decorate our cactus whenever we get a chance. Saguaro cactus is relatively easy to decorate. There was a home we used to drive by that had 3 saguaro cacti and every year they would decorate them as the 3 wise men – they looked just great. Water is a much celebrated natural resource and some landscapes have fake desert washes running through their front yard. During Christmas, some decorate their washes with blue lights to signify water. *Fake desert washes were extremely trendy, but are thankfully, on the decline. I admit that I did design some for homeowners who insisted on having them, but I would use large boulders and embed them along the sides to imitate a natural creek bed. Ocotillo make a great stand-in as a Christmas tree. Just hang some ornaments and string the lights. I may have to try this on my Ocotillo next year. You know those nets of Christmas lights that you can spread over shrubs? Look carefully, this homeowner spread his lights over his boulder. I’m not sure where I stand on this one…. Agave americana all lit up. I love how this looks. Some people feel that they have to throw lights on everything in their front yard. They just do not know when to stop. I’m not sure the lights make this Prickly Pear cactus look any better. The majority of homes in the desert are beautifully lit and look like many of the homes where you live. This is one of my favorites. The arborist in me just loves how the lights define the beautiful tree trunks of the Palo Verde and Mesquite trees. *None of these pictures are from my home. My husband is somewhat of a minimalist when it comes to decorating the outside of our home for Christmas…a string of lights around the house is as fancy as he gets. But, I get to go crazy with decorations indoors. I hope you enjoyed this little glimpse of what Christmas in the desert looks like.